Industry observers in the Province of Ontario are now well aware of the scope of the changes introduced through the amendments to the old Ontario Construction Lien Act, giving us what is a dramatically different piece of legislation – the Construction Act. However, becoming familiar with these significant changes and implementing them in practice are two very different undertakings. With prompt payment and adjudication now around the corner, a refresher is therefore in order. In addition, it is important to remember that subject to the application of the Construction Act’s transition provisions, the lien modernization provisions took effect on July 1, 2018, while the prompt payment and adjudication provisions take effect on October 1, 2019. This variation in timing alone will require your organization to pay close attention to the implementation of the Construction Act. It is equally important to understand that the transition provisions mean that we will concurrently have: (a) contracts governed by the old Construction Lien Act; (b) contracts governed by the lien modernization provisions; and (c) contracts governed by both the lien modernization provisions and the prompt payment and adjudication provisions. How do the transition provisions work? a “procurement process”2 for the improvement was commenced before July 1, 2018 by the owner. If a procurement process is not commenced until after October 1, 2019, or a contract that does not involve a procurement process is entered into after October 1, 2019, both the lien modernization provisions and the prompt payment and adjudication provisions will apply. For a full understanding of how the transition provisions work, see Section 87.3 of the Construction Act. almost all public contracts require both performance and labour and material payment bonds (this requirement is qualified for P3 projects). While the lien modernization provisions are essential to understand from an operational perspective, the impact they will have on contract drafting is likely limited, particularly when taking into consideration that all contracts and subcontracts are deemed to be amended as may be necessary to conform to the Construction Act. However, the same argument is unlikely to present a workable practical approach to contract drafting in the context of prompt payment and adjudication. First, many existing forms of contract have detailed provisions addressing both payment requirements and dispute resolution provisions. Leaving these provisions in place on the basis that these contracts will be deemed to conform to the Construction Act will only create confusion. Second, there are certainly strategies that industry participants at all levels of the construction pyramid will wish to employ in drafting and negotiating contracts to manage the new processes and risks introduced by prompt payment and adjudication. Any organization considering how it is going to handle the prompt payment and adjudication amendments from the perspectives of contract negotiations, contract administration, operations and dispute resolution will first need to have an understanding of what these changes entail. Prompt payment and adjudication are, to a certain extent, directly linked. Although adjudication will capture much more than payment disputes, adjudication can also be considered the “teeth” for ensuring compliance with the pending prompt payment requirements. The essence of the prompt payment provisions is a set of statutory deadlines for payments on construction projects, all built around the submission by a contractor to an owner of a “proper invoice”. 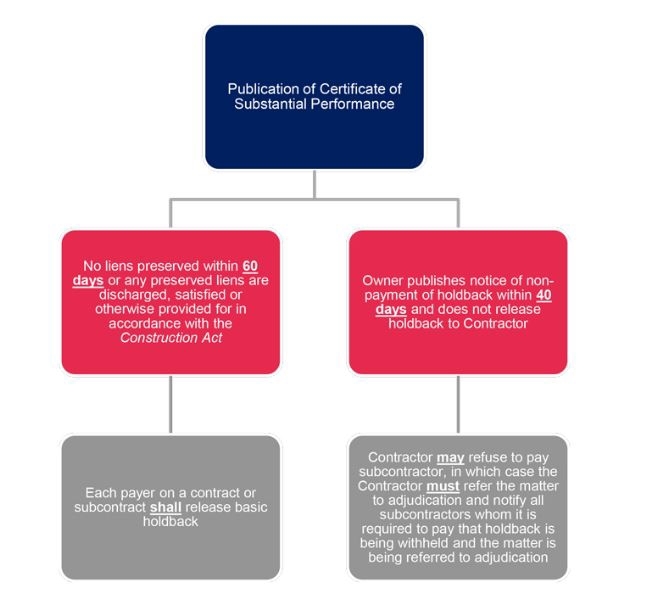 The Construction Act prescribes the minimum information that a proper invoice must include, leaving it to the parties to add additional requirements, provided that these contractual requirements do not conflict with the legislation. In addition, the Construction Act crucially permits parties to agree within their contract upon the schedule for the submission of proper invoices but notably also prescribes a default requirement for proper invoices to be submitted monthly if the contract doesn't state otherwise. This means, for example, that it is open to parties to incorporate a milestone schedule for the delivery of proper invoices into their contract. Again, however, if there is no contractual schedule for the delivery of proper invoices, the parties will be stuck with the monthly schedule prescribed by the Construction Act. Prompt payment continues to apply to each tier of the construction pyramid. The Act should therefore be consulted for the deadlines applicable at each tier. For example, a subcontractor who receives full payment from a Contractor in respect of a proper invoice is required to pay its own subcontractor or supplier within 7 days of receipt of payment or, if it chooses not to pay, must deliver a notice of non-payment within 42 days of the date the proper invoice was given to the Owner. 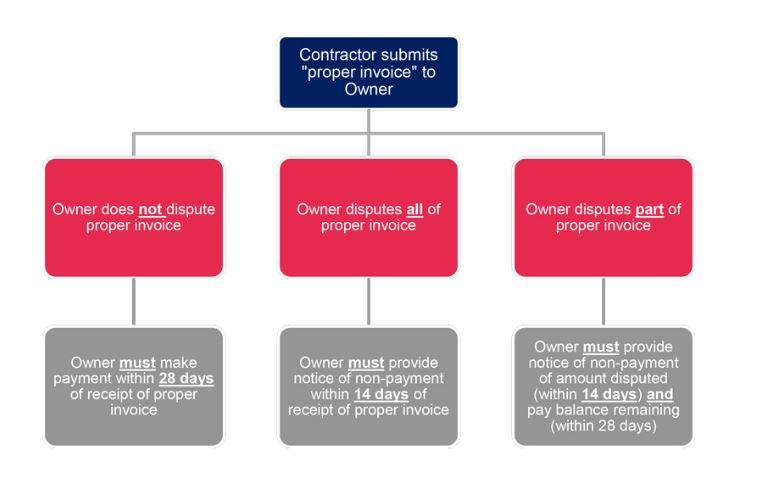 If a subcontractor has received a notice of non-payment from the Contractor, it must deliver its own notice of non-payment within 7 days of receiving the notice from the Contractor or otherwise must pay its own subcontractor or supplier within 42 days of the date the proper invoice was given by the Contractor to the Owner. If a subcontractor chooses not to pay its own subcontractor based upon receipt of a notice of non-payment, it must refer the matter to adjudication within 21 days of giving the notice of non-payment. A failure to abide by the prompt payment provisions triggers various remedies, including the requirement to pay a prescribed rate of interest and the potential referral of the dispute to adjudication. Notably, if the basis for a contractor deciding not to pay its subcontractor is the contractor’s receipt of a notice of non-payment from the owner, or if the basis for the contractor refusing to release holdback to the subcontractor is the receipt of a notice of non-payment of holdback from the owner, then the contractor is required to refer its dispute with the owner to adjudication. 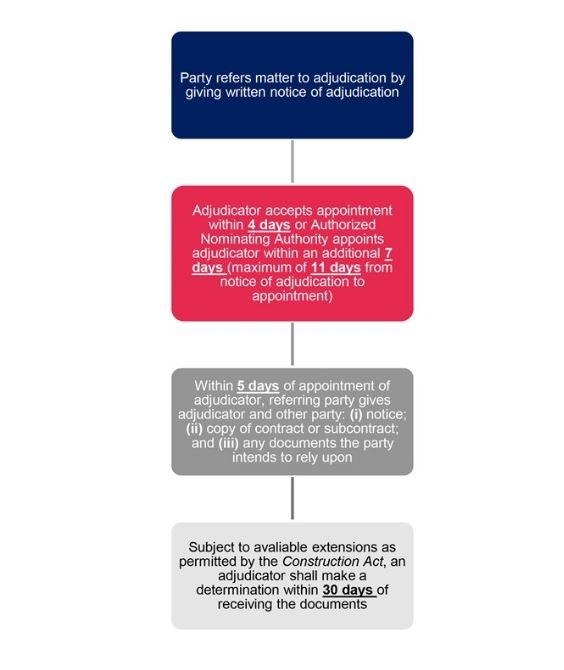 The Construction Act's new adjudication process, described below, is anticipated to have a sweeping impact upon the way typical construction contract disputes are resolved. Adjudication is essentially an interim dispute resolution process that is binding upon the parties. The outcome of adjudication is a “determination” made by the appointed adjudicator. Subject to the very limited ability to have the adjudicator’s determination set aside through a judicial review process, the parties must then abide by that decision and carry on with the project. Should either party wish to re-litigate the issue through a court action or arbitration down the road, they are entitled to do so. However, one of the objectives for the Construction Act changes is for such a scenario to be rare. the determination of an adjudicator may be enforced in court. As described in the above summary, adjudication is a quick process with significant consequences. While adjudication has been subject to criticisms that its outcomes will constitute “rough justice” and that some parties will seek to leverage the tight timelines to their advantage, the objective is for issues to be resolved as they arise so that they will not aggregate and result in lengthy and expensive litigation or arbitration proceedings. Further, recourse will nonetheless remain available to construction liens, arbitration and litigation. In fact, it is generally understood that Ontario will be the only jurisdiction around the world to have both a robust construction lien regime and adjudication running concurrently. Accordingly, it is difficult to accurately predict to what extent adjudication will reduce traditional forms of construction dispute resolution in Ontario. The one certainty is that it is essential for your organization to be prepared for these changes. It should now be apparent that the Construction Act changes will impact every facet of the industry and that the time has now arrived to move from understanding what they are about to preparing your organization to implement them. ✔ consider how current and future project structures may be impacted by Construction Act changes. 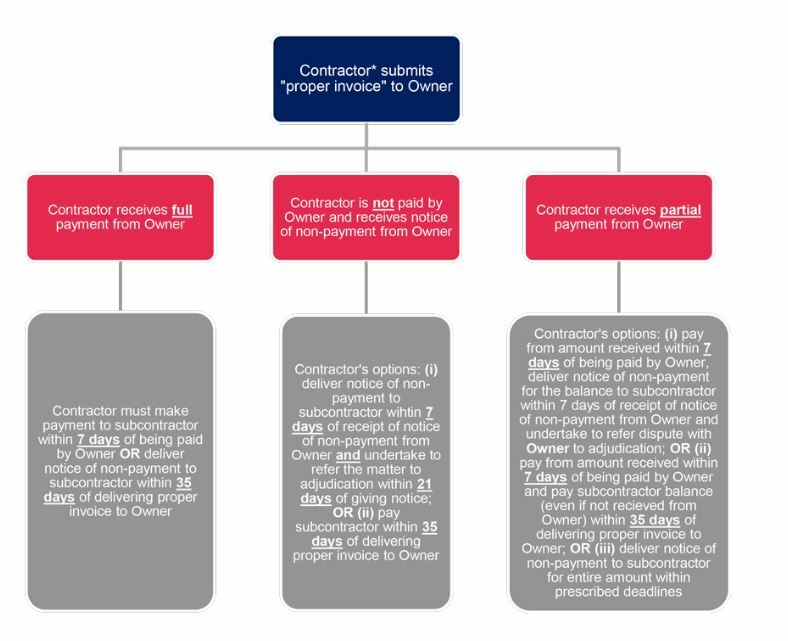 For example, will your contracts need to be revised where milestone payments are used, in order to ensure they comply with the Construction Act? ✔ where custom contracts are used, ensure your terms and conditions are properly updated to reflect the Construction Act changes and manage the new processes that are prescribed. For example, how will your organization approach the content, timing and delivery of “proper invoices”? This checklist is not intended to be comprehensive and will inevitably require refinement depending upon the role of your organization in the construction pyramid and the nature of the projects in which you are involved. However, with October 1, 2019 around the corner and the lien modernization provisions already in place, it is critical to now take the necessary steps to ensure you are ready for these changes to be implemented.